Red lentil pasta with a creamy sundried tomato garlic sauce on top. This is what easy-dinner-dreams are made of. I know, I know .. I'm known to have complicated recipes around here. But I mean, meals that are entirely made from scratch at home with feel-good ingredients, usually are. But not this one folks - and it's made from scratch (ehh kinda, the pasta isn't obviously because I'm not that talented), but the sauce is. And it is filled with goodness like red bell peppers, sundried tomatoes, garlic, basil..
and of course it's free of refined oil, refined sugar, and it happens to be gluten free as well, so hooray for that! I love using lentil pasta as my pasta of choice. It's gluten free, less processed than wheat pasta, and it's alkaline compared to wheat which is acidic to the body. I've tried black bean pasta before and I'm not really a fan. Not sure if it's user error but black bean pasta always turns out really mushy for me, and breaks down way too easily. 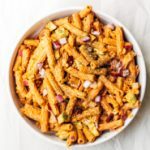 I've been using this red lentil pasta (affiliate link) from Trader Joe's, and even though it is a little heavier than regular pasta, it has quickly become a favorite of mine and a must-have pantry item for those lazy nights or last-minute lunch meals. Pasta made out of lentils is a great alternative to wheat pasta for those that suffer from a gluten intolerance. It's also a better choice for those who prefer alkaline-forming foods over acid-forming foods. Wheat is acid-forming to the body while lentils are alkaline-forming. It is believed that disease thrives better in acidic environments and so it is beneficial to include alkaline forming foods into your diet often... and this lentil pasta fits the bill! The sundried tomato garlic sauce is also very simple and straightforward. Add all ingredients to your blender and combine until smooth and creamy. Once pasta is ready - drain and keep in the warm pot.. add the sauce and any additional toppings such as chopped red onions, avocado slices, and chopped basil and gently combine. Serve while still warm and fresh, and enjoy the left overs as a cold pasta salad (or reheat of course). Want to see more healthy vegan dinner recipes? If you're into spicy you're going to love this Healthy Buffalo Cauliflower Casserole, or this Easy Vegan Smoky Red Lentil Stew with hearty quinoa on the side.. or if you're in the mood for nachos you're going to love this Best Vegan Loaded Nachos Ever recipe. 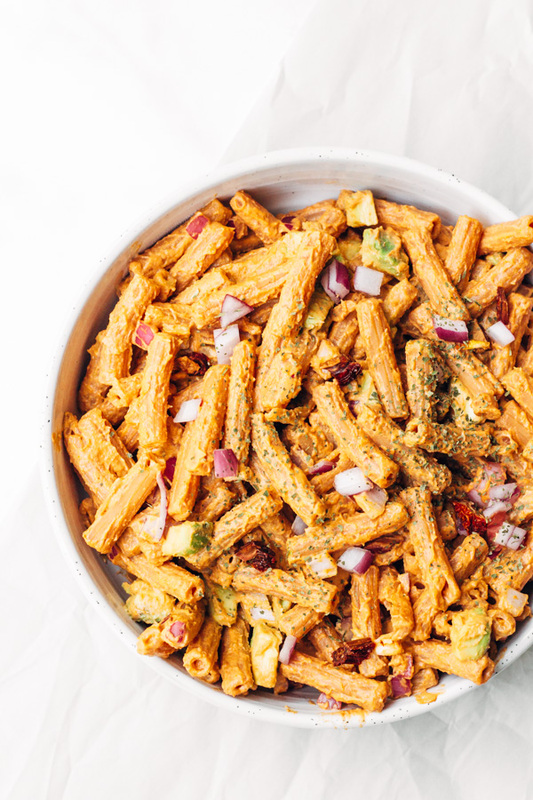 Red lentil pasta with a creamy sun-dried tomato – red bell pepper – garlic sauce. Topped with chopped red onions, avocados, and a pinch of dried basil for extra yum! Cook red lentil pasta according to package instructions. Make creamy sundried tomato sauce. Add all ingredients to a blender and combine until smooth. Drain the pasta and return to the hot pot. Add 1/2 cup of vegan sundried tomato sauce and toppings into the pot and stir to combine. You can add more pasta sauce as needed to suit your taste. Serve and enjoy. For ultimate creaminess if not using a high powered blender – soak your cashews for at least 30 minutes in room temperature (or hot) water. Also, this sun dried tomato sauce is very flexible and forgiving. You can totally get away with a much simpler version by eliminating the red bell pepper, leaving out the garlic clove, using less sun dried tomatoes… the point is – even if you don’t have all these ingredients exactly in your pantry, you’ll still end up with something very delicious.